By now you're surely already familiar with Mondo, the company behind some of the most innovative and beautiful poster designs around, for both classic films and new releases. Their newest partner comes from their partnership with Drafthouse Films, which will be releasing The Ambassador in New York on August 29 and Los Angeles on August 31, with a national roll-out to follow. 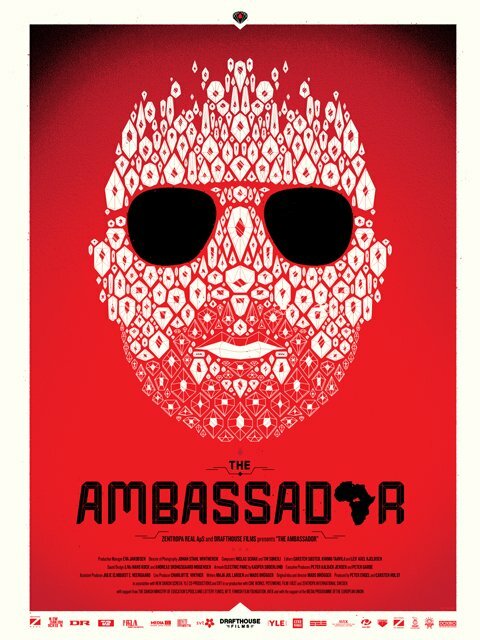 The Ambassador is a Danish import from famously provocative filmmaker Mads Brugger, but before we tell you what it's all about, check out the brand-new poster, which will go on sale tomorrow, August 23 (follow Mondo on Twitter for the exact sales time). Here's the plot synopsis for The Ambassador, followed by the information about this poster. So subscribe to Mondo News and make sure you're ready when this poster goes on sale tomorrow. And if you're not in New York or Los Angeles, never fear-- The Ambassador is available right now on VOD on digital platforms.